Anne from Alberta (aka annkelliott@Flickr) shares another of her great images with BPotD (original | BPotD Flickr Group Pool). Thank you, Anne! As a child, I thought castor oil was an extract from animals (beavers, specifically). I suppose I can blame that on childhood logic after learning the French name for beaver. It was only much later when I learned that it was a plant derivative from the species in today’s photograph, Ricinus communis, or the castor bean plant. Wikipedia provides a detailed summary of the chemistry and uses of castor oil. In particular, the use as an instrument of intimidation is both interesting and disgusting. Despite the many uses of castor oil, Ricinus communis also happens to contain a deadly poison, ricin. The entire plant is poisonous if ingested, but the seeds are particularly potent; one chewed seed may be enough to kill a child, see: ricin toxin. The Cornell web site also contains a page about the plant itself, Ricinus communis, where it explains that ricin is water-soluble and hence will not find its way into castor oil during the production process provided proper precautionary measures are taken (thanks to Anne for the link, as well). The widespread tropical and subtropical cultivation of Ricinus communis has made it difficult to determine its original distribution. 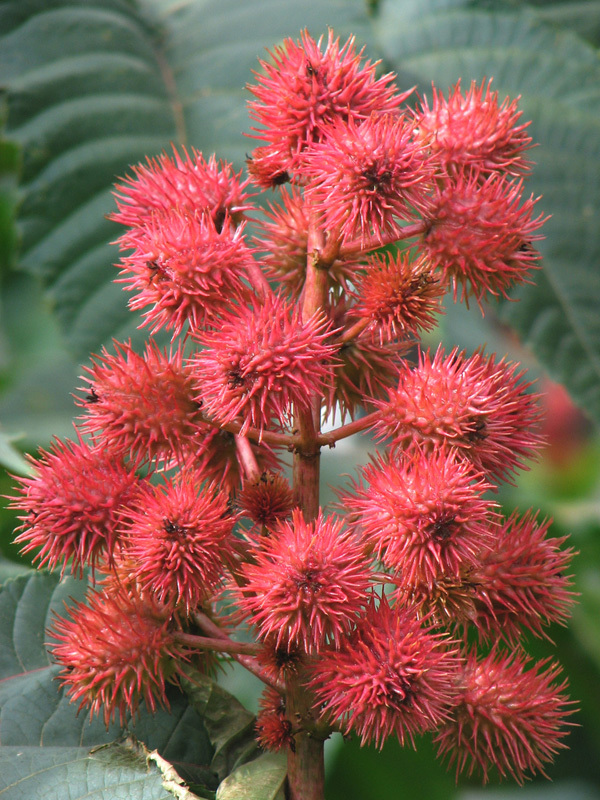 The Handbook of Energy Crops, in addition to providing extensive details about cultivation and production, suggests Ricinus communis is African in origin. The comprehensive photographs of the species available on MissouriPlants.com are accompanied by a write-up suggesting an Asian origin. Very interesting, especially the links of the supposed origin. It’s a weed here in Sydney, Australia. It can be found growing in disturbed soils typically in places like railway embankments and the edges of urban bushland. Today I am amazed with all the information I could get on Caster Bean Plant. I did not know ricin was connected. I have spent 45mins just checking out links and have learned so much. I have been growing Herbs since 1968 and studying them for many years. My brother is a Medical Doctor and we have researched many herbs and their compounds. I have sent him today photograph and he will be so pleased at all we can get to and learn from. Again while flower or whatever it is as in some links it is suggested to be the fruit may be beautiful for a full gnosis gestalt of what castorbean or ricinus is the whole above ground plant must be illustrated as fully as possible. The links are excellent as always but at least while the chemistry is superb a triglyceride not an alkaloid hence causing diarrhoea as being non absorbable due to the length of the ricin FFA and OH radical the botanicals drive me mad. They describe an octopalmated leaf yet their illustrations show 7 or 9 rays not 8. Must have photoed different species. Will the real ricinus communis please stand up? Daniel, I want to tell you more. Many people around Western Massachusette have been using Caster Bean plant in their gradens. As a Master Gardener for over 19 yrs I need to always follow up information on posinous plants to warn the general public about them. The Western Mass Master Gardeners Association needs all the information dangerous plants especially to protect out children and grandchildren. Todays plant will help us so much. There used to be a magnificent specimen growing along one of the lagoons here in north San Diego County: 25′ tall, 30′ spread, with the main trunk >1′ diameter at the base. No idea how old it was, but gone now due to a landslide a couple years back. As a kid, I would occasionally collect the seeds because they’re so beautiful, but I did so knowing they were deadly. Castor used to be a not-uncommon plant in some of the wetter chapparel areas, along with “wild tobacco” (sp? ), and we were taught that they were both toxic. Both are now quite uncommon, but as they’re non-native, that’s OK. I have mixed info about the toxicity of castor beans. While at school a class clown ate several seeds despite being told of their poisonous nature, he suffered no ill effects, I suspect that he swallowed them whole rather than chewing them. Having 22 years of co-operation with the local hospital system as a consultant on plant poisons (mostly mushrooms ) I have noticed that in a number of cases where persons had swallowed hard coated seeds with a reputation of being poisonous , they had no ill effects while the seed coat remained intact. On the other hand, castor beans appear to be a highly effective rodenticide, being apparently highly lethal to, at least, rats and mice (I’ve not done a head count so this must be regarded as anecdotal). My botany professor undergrad (1970) related how she had become severely ill from just a tiny bit of the seed caught in her tooth and cautioned us according. And before using the seeds as a homemade rodenticide, please consider that the natural predators of mice and rats are often our beloved housecats and beautiful, sometimes endangered, raptors – hawks, falcons etc – who can die from ingesting poisoned rodents. The question re rodenticide ricinus bean is intriguing not least because I suspect that poisons would be mainly excreted altered metabolised especially organics whether alkaloids or triglycerides. So even a Coumadin or Warfarin killed mouse might not kill a cat. Then again some predators are fussy and eat only live struggling prey and wont even look at dead ones. That would protect them. Might be different with chemical poisons such as cyanide in fish as the disaster in the river Tisza a few years ago when gold leachate was released. They buried a hecatomb of fish and I was wondering if that was necessary as the cyanide must have evaporated or reacted to form harmless compounds. It is very reactive thats why it kills. Ricin is an extremely toxic lectin and haemagglutinin unrelated therefore to the oil from the same plant but lethal only when the bean is well masticated. If it haemagglutinates then it must be deactivated so the predator might be unaffected. But I would not try to eat or serve cyanide ricin or warfarin killed animals. Just in case.